I often wonder if the F1 Gods have a rather wicked sense of humour. Certainly they often give this outward impression. Prior to the season start with the new regulations there were a few rather hushed and awed comments doing the rounds to the effect of 'just wait until they're driving these cars in the wet', what with the vastly increased torque and reduced grip. Well, as of today you can make it two qualifying sessions in the new formula, and two in which the rain came down. And today it really came down. Someone in advance of the Sepang qualifying hour said the chance of the elements disrupting things was 45%, but as water started to descend at full force 45 minutes out of the nominal session start time and refused to stop the chance looked 100%. Generously. The green flag was delayed as a result by close to an hour, and after it did fall the track was wet to varying degrees throughout as the rain still had a few more stabs left in it. And with (fairly) similar conditions to those of the previous qualifying session in Melbourne we got a fairly similar outcome: once again the Mercedes looked hard to stop even when faced with precipitation (perhaps right now only half a metre of snow would send its cars down the order). But just like then one thing the elements did do was hoist the fine-handling but probably underpowered Red Bull right up to the sharp end. Just like then it was Lewis Hamilton who got the job done when it really mattered, and Nico Rosberg who'd looked close throughout fading slightly at the vital moment of Q3. Just like then Lewis seized pole position, while Rosberg was left a little adrift to only be able to line up directly behind in third place. And just like then it is a Red Bull that lines up between, but in a variation from Melbourne it is one Sebastian Vettel who is providing the irritation; moreover he set a best just five hundredths shy of Lewis's. It was a stunning effort, but one that may come tinged with regret, as he missed out on one final chance to better his slot even further by getting a bit too clever when trying to create space on track for his final run, resulting in him crossing the line a breath after the clock hit zero. About the only consolation for Seb was that there wasn't much improvement going on generally at that point; indeed about the only change of note was Rosberg pipping Fernando Alonso to third place. Lewis himself indeed had to abandon his final effort due to the impaired visibility from running behind a rival. 'For sure Q3 was not perfect' said Seb afterwards, his words rather loaded. 'I felt that there was a little bit of time to gain here and there'. 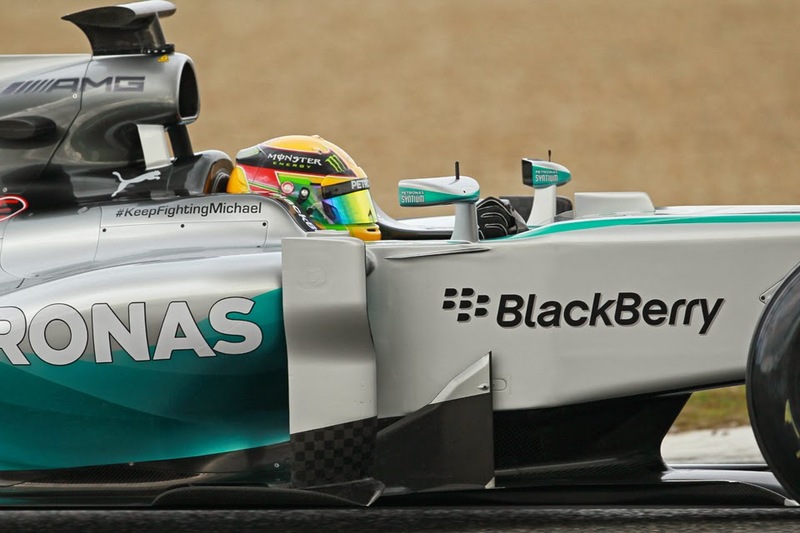 But he was also philosophical: 'Equally I think if Lewis had another chance he would have improved as well. So would, could, should at the end of the day'. Lewis meanwhile seemed a little discombobulated by his effort afterwards, but didn't fail to appreciate the strength of his position: '(I'm a) bit all of the place at the moment...today was just incredible...very, very tricky out there...the team is performing fantastically right now'. There were plenty of brave and impressive performances out there today, though perhaps chief among them was Alonso's. Indeed, for a moment it looked like he wouldn't get nearly that far - as everyone circulated on their out laps in Q2 Daniil Kvyat sent his Toro Rosso up the inside of the Ferrari from some distance back, Alonso perhaps understandably didn't see him coming and the resultant contact not only removed the Toro Rosso's nose but it also snapped a wishbone on the F14 T's front suspension. 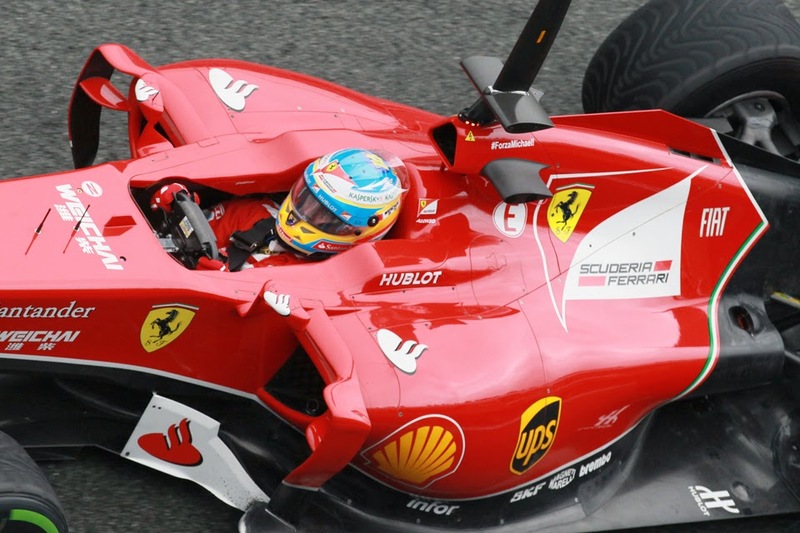 Everyone thought that would be that for Nando, but the Ferrari mechanics showed speed of fingerwork that would put even Audi's Le Mans crew to shame: almost unbelievably Alonso was back out circulating long before the session was over. The car was still far from healed however: 'The mechanics did a fantastic job' said Alonso, 'but I have to say the car was not totally prepared: the steering on the right was so light, on the left was so heavy, that it was very very strange to drive, but enough to complete qualifying...obviously I'm super happy with this qualifying, it's probably the biggest smile from a fourth position of my career'. And he's justified in feeling that way: that the Spaniard got the thing up where he did, seven tenths off pole and only just edged out by Rosberg as mentioned, was startling. 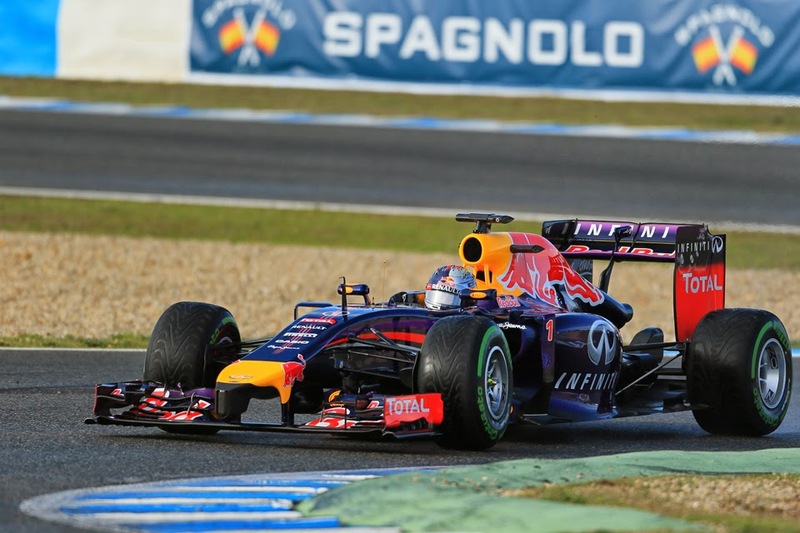 He also was upwards of a second quicker of the best of his stable mate Kimi Raikkonen. Kimi will be one regretting the rain today more than most, as in the dry practice sessions he appeared to have Nando's legs all of a sudden - his handling problems sorted much more quickly than anticipated (those Ferrari guys seem quick at everything). But in another point that reflected last week rain in qualifying exacerbated the gap in Nando's favour. Kimi may heave some relief though that the gaping difference on the watch translated to just two grid slots. If the rain stays away tomorrow he'll be worth watching. Another to have cause for regret at the elements doing their worst was Williams: who once again found the rain rather diminished the cars' potential. Felipe Massa will start P13, and Valtteri Bottas who gambled on intermediates in Q2 will line up five places further back, in part due to a three-place drop from getting in the way of Daniel Ricciardo. Of course, a lot in Malaysia depends upon the weather, and rain - particularly if it arrives suddenly - can turn things on their head. A dry race probably means for the win Mercedes versus reliability once again, with the only additional question being which Merc prevails. If it rains again (and more is forecast, natch) the silver cars' battle with Seb will likely be one to savour. Perhaps Alonso if his car can be fixed will make a thorough pest of himself too. If it's dry the pair may however have a job keeping some of the other Merc runners behind. Williams especially you'd have thought will make progress, and will be hoping to avoid the calamities that compromised the cars' results in Melbourne. As will most of the rest of us. But if we take one more potential parallel with a fortnight ago, then the picture of qualifying was changed beyond recognition after but a handful of corners of the race. And with a long run to turn one where a tight switchback - the scene of much grief in the past - awaits there are possibilities for similar this time too. And in another thing that didn't change from the opening round, and indeed hasn't changed for a while now, Nico Hulkenberg was right up there in Malaysia's qualifying. He starts seventh, and it occurs that Hulk's magnificent performances are so habitual now that we've almost reached the point that we don't comment upon them, despite their brilliance. This too from a driver supposedly too heavy for the current formula. Odd are the ways of the F1 team principal.